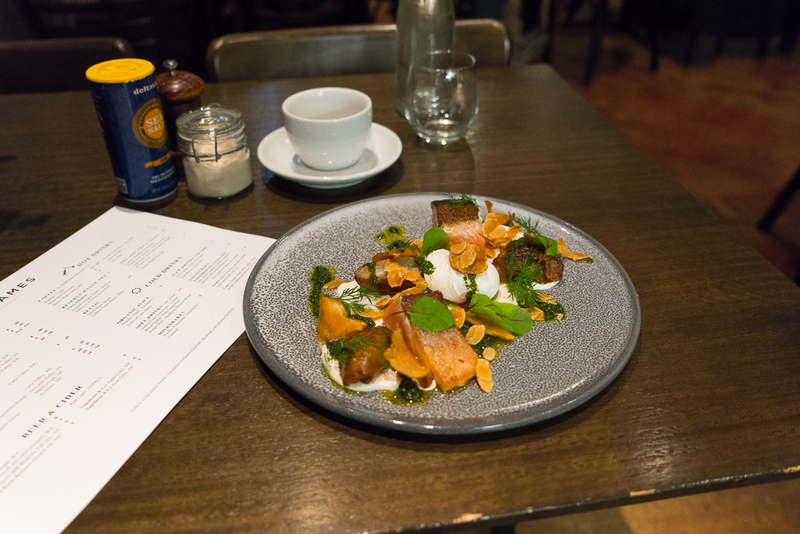 New dishes at CH James are top notch, restaurant quality food in a cafe we believe. When looking at different cafes it's often the little touches that sets them apart. CH James doesn't compromise on premium ingredients and each dish gives the customer more than what they might expect. Hummus Bowl, creole spiced avocado, crispy chickpeas, raw beets, activated almonds & yoghurt flatbread. Add house cured Tasmanian salmon or poached chicken breast. 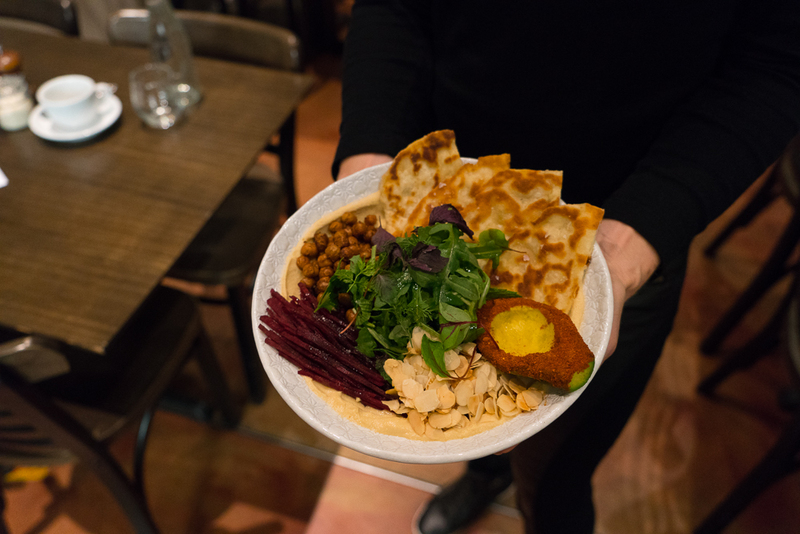 New on the scene is a compelling Hummus Bowl. 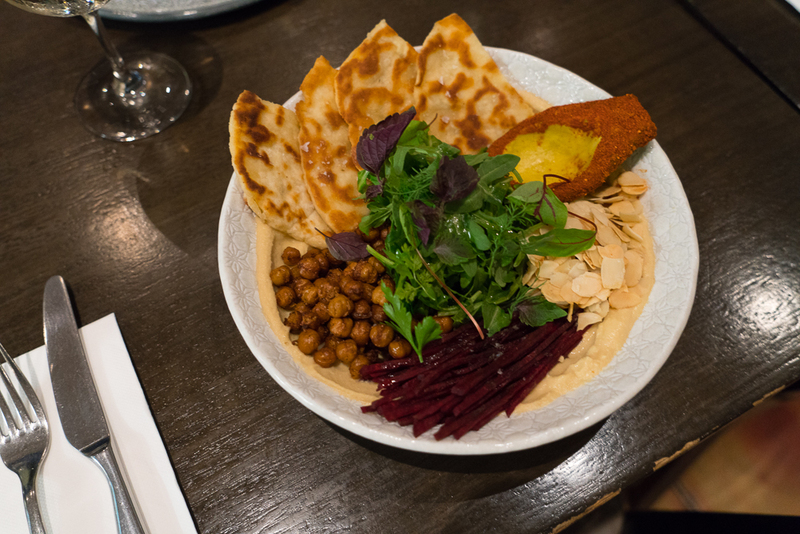 We love hummus at the best of times, but CH James have elevated it to a feature dish. This is not your hummus appetiser. Rather it's a bowl full of top notch ingredients. The hero of the dish is the hummus but the creole spiced avocado is a talking piece, as is the crispy chickpeas. Yoghurt flatbread is delightful to mop up the hummus - or even the chickpeas. This bowl has plenty going on with activated almonds and raw beets. A healthy tasty even sophisticated dish! Well presented like every other CH James dish - well thought out and looks great. Where would you start in eating this dish? The avocado? Dive straight into the hummus? Corn and Haloumi Fritters, poached eggs, romesco, charred leeks, salsa verde. Add House cured Tasmanian Salmon. 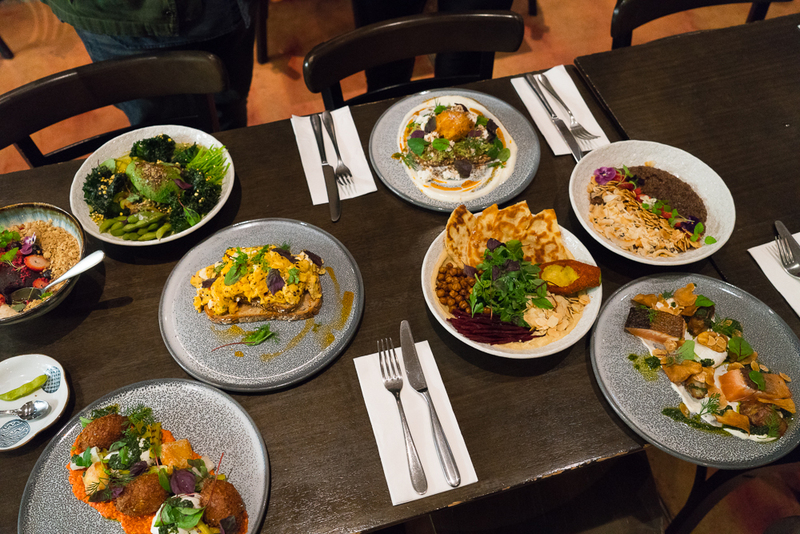 Fritters are a Melbourne favourite with a cult following. 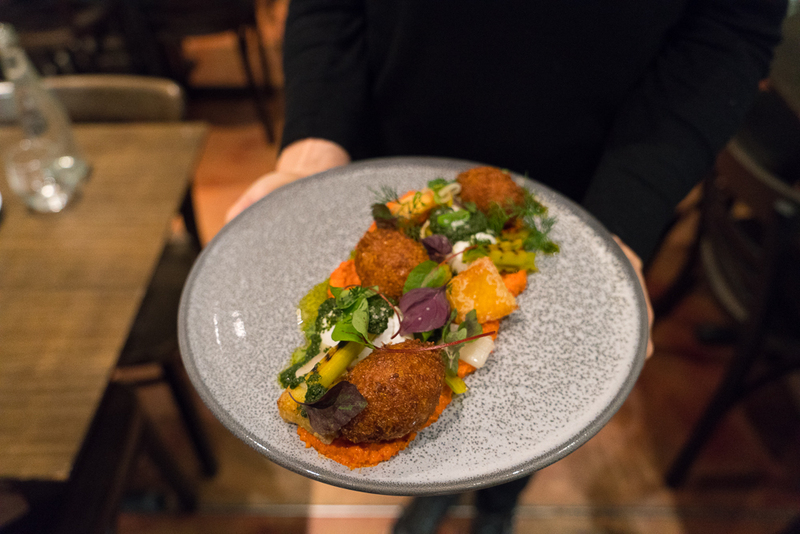 These fritters are top notch - corn fritters with an element of haloumi- with perfect density. But then add in poached eggs, romesco, charred leeks and the flair of salse verde. Romesco roast capsicum sauce is fabulous. Taste and texture are stunning and the presentation is top notch also. Something that wouldn't look amiss in the NGV. 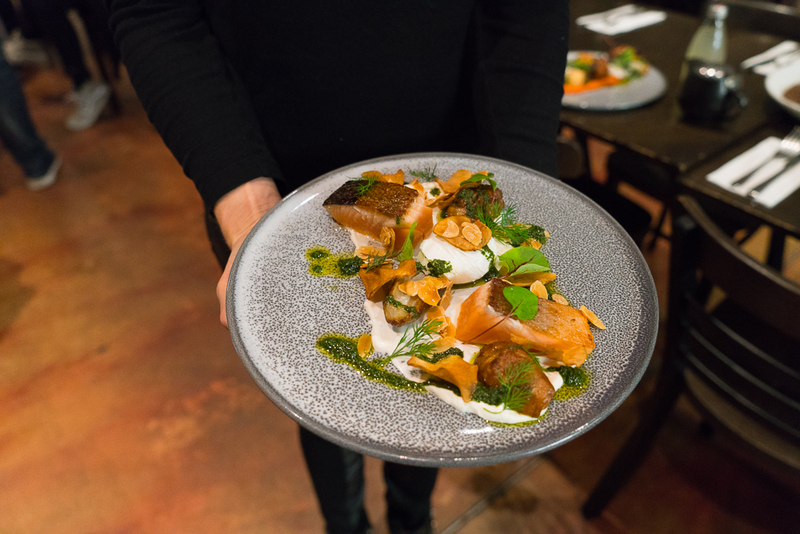 Pan Roasted Tasmanian Salmon, whipped feta, Jerusalem artichoke, poached egg, salsa verde. My mother enjoyed this dish saying it was the best Tasmanian Salmon dish she has ever eaten! High praise from someone about to turn 80 years old and who loves Tasmanian Salmon! Decent portions of salmon with crispy skin. Whoever thought of pairing with Jerusalem artichoke is a genius. The poached egg and salsa verde set the dish off, not to mention whipped feta. A triumph. Once again we had to take another photo - a culinary masterpiece. The little touches. 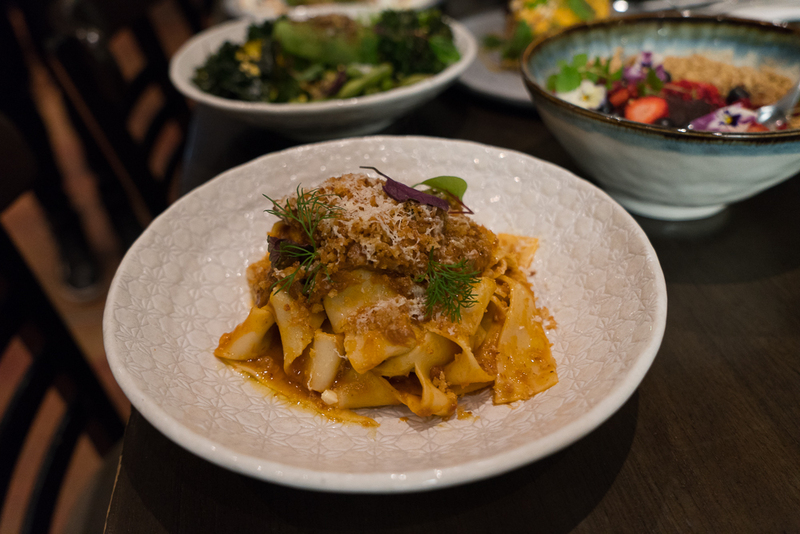 Slow Cooked Beef Chuck, pappardelle, pecorino, pangrattato. A pasta dish is essential for winter. But it needs to have flair and bring rustic charm that you want to come back to it again and again. This dish was a toast of the staff menu tasting night. Yes the pasta is cooked perfectly. It's the quality of the beef chuck that makes this dish amazing - slow cooked and full of flavour. Pappardelle is such a great type of pasta with its long and broad noodles. CH James has enabled the sauce to stick to the pasta, something that Italians desire. Shavings of pecorino set off the dish. The pangrattato bread crumbs further bring a rustic element to the dish. As my daughter had her first bite, she looked at me and exclaimed this dish was absolutely delicious. A compelling winter warmer! CH James take pride in their menu and bring flair and innovation, catering to a range of customer tastes with quality offerings. Highly recommended.